Brian Meinders has won the World Series of Poker $1,500 limit hold’em shootout, capturing his first WSOP gold bracelet, the $116,118 first place prize and 600 Card Player Player of the Year points. All he had to do was win all the chips at three consecutive tables playing limit hold’em. If that sounds easy enough to you, keep in mind that the 365 other entrants were unable to do it. A total of 50 players made the money in this event, including Justin Bonomo, Matt Matros, Scott Seiver, “Crazy” Mike Thorpe, Mike Leah, Ari Engel and Greg Mueller. Of the 50, forty had to settle for only a min-cash of $3,088, while only ten made the final day , including Ian Johns (9th – $9,225), Sean Rice (8th – $11,992), Brock Parker (5th -$ 27,986) and Victor Ramdin (4th – $37,897). Meinders began heads-up play with the chip lead and never relinquished it. 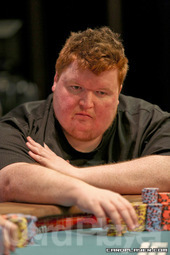 On the final hand, Meinders opened the button for a raise and Darin Thomas called from the big blind. The flop came 10 8 6 , Thomas checked, Meinders bet 20,000, Thomas raised to 40,000, Meinders three-bet, Thomas got it all in and Meinders called. Thomas was all in for his tournament life and led on the flop with Q 6 for bottom pair against Meinders’ flush draw with 5 3 . The turn brought the 4 , giving Meinders additional outs with a straight draw, and the 7 on the river completed his flush, giving him the pot and the title.